Mayor of Tuttlingen Michael Beck presents mechatronics student Marcel Pache with the Tuttlingen Citizens' Foundation Prize. Dr. Hans-Henning Winkler (left) and Mayor Michael Beck (right) with the prizewinners of the Dr. Winkler Foundation for the Promotion of young Talent (from left): Tobias Brouwer, Karin Simon, Laura Moosmann, Anna-Loan Bregulla and Gabriel Fischer. Markus Waizenegger (second from left) with the Kreissparkasse Tuttlingen prizewinners (from left): Sina Höfs, Corina Ilg and Jan Sommer (Elias Rohrer missing). On 1 October 2018 the winter semester at Furtwangen University (HFU) started with 1,220 new first semester students: on the Furtwangen Campus, 673, on the Schwenningen Campus, 391 and on theTuttlingen Campus, 156. For the first time HFU accepted applications for bachelor programmes using the Germany-wide application portal "hochschulstart.de". And the number of applicants has risen considerably: in Winter Semester 2017/18, there were 4,916 applications for degree programmes; this year the number is already over 5,900. Application for some programmes is still possible. This semester the University again has over 6,400 students on its 3 campuses. A year ago in Winter Semester 2017/18, 6,458 students were enrolled. In total 48 different degree programmes are on offer. Those with the highest number of applications are "Media Design", "Applied Health Sciences" and "International Business Management". 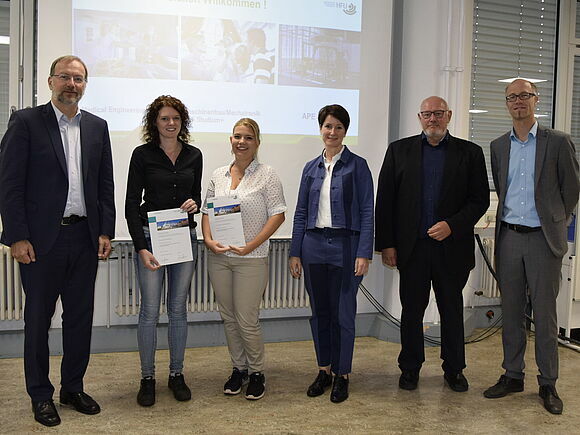 During the First Semester Welcome, prizes for the outstanding achievement of HFU students are awarded: in Furtwangen the EGT von Schoen'sche Innovation Prize, in Schwenningen the Aesculap Prize, the German Academic Exchange Service (DAAD) Prize and the HFU Teaching Prize, and in Tuttlingen prizes from the Dr. Winkler Foundation, the Kreissparkasse and the Tuttlingen Citizens' Foundation. Every year students are asked to nominate teachers whose lectures are particularly good for the HFU Teaching Prize. The jury selected the lectures on "Sustainable Process Engineering" by Professor Dr. Holger Schneider (Faculty of Medical and Life Sciences, Schwenningen Campus) from the 78 teachers nominated by the students. The prize and prize money in the amount of €1,000, was awarded by University President Prof. Dr. Rolf Schofer. Students nominated Professor Schneider's course because, besides being very informative, it is also well-structured, motivating and fun. Dr. Schneider teaches courses on Process Engineering, Bio-process Engineering and Sustainable Use of Waste and Residual Material in the Foodstuffs Industry. Felix Ehinger, who wrote his International Business degree thesis on the distribution of electric cars in Germany, received the €1,000 EGT prizemoney from Rudolf Kastner, Chairman of the Board of EGT, in Furtwangen. Two students shared the Aesculap Prize in the value of € 5,000 Euro: Anja Kretschmer, Computer Science in Media, who wrote about scene reconstruction and camera calibration from heterogenious stereoscopic picture sources; Andrea Schneidersmann, Applied Health Sciences, who compared mortality rates in cities and states.. The DAAD Prize is awarded every year to a student who has displayed both outstanding academic performance and social or intercultural involvement. This year it was awarded to the HFU Business School MBA student Sudhir Kumar Sundaresan from India for his active involvement in lectures, Campus Day, Business Talks and for the support given to fellow students. The Tuttlingen Citizens' Foundation Social Prize and prizemoney of € 500 was presented to Marcel Pache, a 7th-semester Industrial Automation and Mechatronics student and father of two small children for his active involvement in student representation on the Tuttlingen Campus as class representative and as student representative on the Faculty Board the Student Commission and the Senate. A few study places are still available. The current list can be found on our homepage.